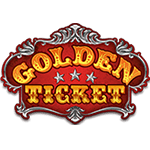 Golden Ticket – 5 Reel, 10 Payline, Play’n Go non-progressive video slot with a Wild Symbol, Cascading Symbols, Multiplier, Free Spins and a Bonus game. 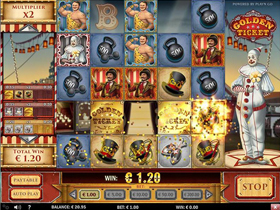 Golden Ticket is a brand new online slot which could be described as more of an arcade game. Players receive an exciting front seat in the circus tent lit up by thousands of little white spotlights. See clowns and rabbits escaping from hats! This unique game offers a grid of 5 x 5 symbols with winning combinations activated once 3 or more symbols are vertically or horizontally aligned. The slot can be confusing as the reels tumble and explode into new wins, but soon enough players will understand how the Golden Tickets are created! The Golden Ticket replaces all other symbols to form winning combinations. The aim of this game is to make horizontal or vertical lines of 3 or more matching symbols. It is allowed to form combos with symbols which don't quite match, such as the different dumbbells and top hats. Symbols will drop from the top of the slot and any wins will generate a Golden Ticket wild symbol the middle of that particular win. Should more wins be generated after the first win more golden tickets will be created which can lead to a string of wins as the reels tumble. Behind the symbols on each spin the word Bonus will appear, by clearing this column completely during the cascading wins an extra 10 free spins will be awarded in the bonus round. The screen will become a fairground style shooting range. 5 matching targets will lead to them being shot, shooting various kinds of targets with each spin will add up to a 5 x multiplier. 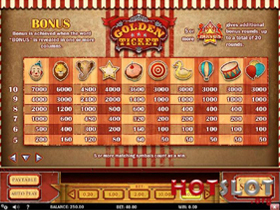 Golden Ticket is an exciting new game with the cascading feature and bonus feature. This is a low variance game with smaller but regular wins which is definitely worth it.